Multimedia provides new opportunities for museums to enhance their visitors' experience. However, its use poses new challenges for presentation preparation, among which are how to enrich the visit while not diverting the visitors' attention from the actual objects in the museum, which should remain the focus of the visit; and how to provide a rich information space suitable for a wide variety of visitors. These challenges need to be addressed during planning and preparation of information presentations for mobile, multimedia museum visitors' guides. This work presents lessons learned about the preparation of multimedia presentations for museum visitors' guides in the course of the PEACH and PIL projects. While planning presentations, designers need to consider the exhibition as a whole, its objectives, its objects, and the information a user may be interested in. Then, in light of the resulting generic goals, they must elicit relevant text and images and combine them using appropriate cinematographic techniques into integrated multimedia presentations. All the above is abstracted into a nine-step multimedia presentation preparation framework described in this paper. The learning experience that takes place in museums nowadays is free-choice. It tends to be personal; it is self-motivated, self-paced, and exploratory by nature. The visitor chooses what, where and when to learn (McLean, 1996; Falk and Dierking, 2000). The museum guidebook was the original portable interaction medium, designed to support the visitors during the learning experience. It was later enhanced by the audio guide, a more technological medium which is commonly used nowadays. Audio guides free visitors from having to read text panels, and thus allows them to concentrate on the exhibits (Evans and Sterry, 1999). The portability of the audio guides can be combined with the level of interaction and media richness of CD-ROM and interactive multimedia kiosks. This fusing of technologies resulted in a portable computer with an interactive multimedia application called GEMISIS 2000, whose use was demonstrated in the Fibers, Fabrics and Fashion section of a museum gallery featuring a textile mill. The findings of an evaluation of GEMESIS 2000 showed that portable computers are popular with visitors, enhance their learning, and increase the time they spend in the gallery (Evans and Sterry, 1999). However, the size and weight of the portable computer and its display are critical for museum application (Sparacino, 2002); indeed the least-liked aspect of the portable computer in GEMISIS 2000 was that it was too heavy (Evans and Sterry, 1999). Personal Digital Assistants (PDA's), which were found very effective because of their smaller size and lighter weight (Sparacino, 2002), have therefore been introduced into museums (Not et al., 1997). An example of PDA application can be seen at Genoa's Costa Aquarium. This media system focuses on simplicity, low level intrusiveness, support for natural interaction, and current-state visibility. The interface's basic element is a multimedia card that corresponds to each presentation subject, such as a particular fish or a fish tank containing several fish species. Each multimedia card provides users with content and touch-screen buttons that allow them to control content presentation and navigate between tanks (previous/next, since the visiting path is sequential)(Bellotti et al., 2002). The PEACH project (Personal Experience with Active Cultural Heritage) is another example of a PDA-based application(PEACH, 2005). Zancanaro et al. (2003) have applied the idea of using cinematographic techniques for presenting details of artworks in a multimedia guide prototype which aims at providing visitors with personalized experiences. The evaluation of an initial multimedia guide (Alfaro et al., 2004) showed that many users would have liked to control the length of presentation. In a later guide prototype (Rocchi et al., 2004), the focus was on automatically produced video clips played on the mobile device, using a life-like figure either as an anchorman or as a presenter that accompanies the visitor throughout the visit. Additional prototypes focused on providing easy-to-use interfaces that allow users to signal their interest in the topic being presented and support better personalization of the presentation delivered (Goren-Bar et al., 2005). Interactive multimedia constitutes a promising communication tool for cultural heritage attractions and for museums that can thereby complement existing interpretative techniques. They are excellent interpreters, since they add visual aspects to the textual and audio material. They can communicate large amounts of often complex information in a user-friendly and interesting way, whilst allowing visitors to access the information they require at their own pace (Alison and Gwaltney, 1991). However, interactive multimedia exhibits should not replace traditional interpretation methods, but rather complement them, and should assist museum visitors by placing exhibits and artifacts in their historical and cultural context. One of the main challenges is how to design a multimedia presentation in such a way that it will convey the information to the visitors, thus enriching the visit experience, without distracting their attention from the exhibits themselves. The process of presentation preparation is thus rendered more complex. The preparation of presentations for such multimedia guides has not yet been widely discussed. This paper presents a methodological approach for multimedia presentation preparation addressing the above-mentioned challenges; it was developed in the PIL (PEACH, Israel) project (PIL, 2006), based on and combined with experience gained in the PEACH project. The following sections suggest guidelines for preparation of multimedia presentations that will enrich and complement visitors' experiences without taking the place of the exhibits themselves. They are illustrated by examples taken from two exhibitions at the Hecht Museum (http://mushecht.haifa.ac.il/) for which multimedia presentations are prepared: 'The Ma'agan Mikhael Ship, The Recovery of a 2400-year-old Merchantman Wreck' (hereafter: the ship exhibition, see Figure 1), and 'Phoenicians on the Northern Coast of Israel in the Biblical Period' (hereafter: the Phoenicians exhibition, see Figure 2). Nine steps were identified in the process of preparing presentations, as presented in Table 1 and detailed later on in the course of the paper. Exhibitions usually have a concept or a Main Idea which should clarify, limit, and focus their nature and scope. All stages of presentation preparation should follow this main idea, as suggested by Serrell (1996). The multimedia guide must directly reflect the exhibition's main idea, whether it summarizes or emphasizes certain aspects of it, by indicating angles of approach or aspects that the presentation emphasizes (Lamarche, 1995; McLean, 1996). 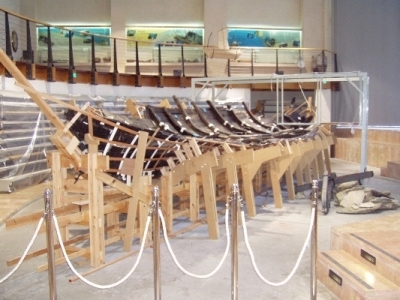 The Main Idea in the case of the ship exhibition is the study of ancient ship technology and maritime history and archaeology (Vortruba, 2004). 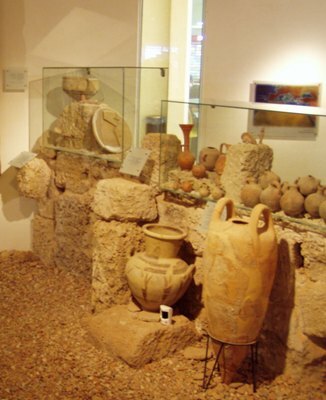 The Main Idea in the case of the Phoenicians exhibition is to provide a picture of the material culture of the Phoenicians as it emerges from the excavations in the northern coast of Israel (Raban and Stieglitz, 1993). Listing of the exhibits is not merely a technical step; it should also include some analysis about the exhibits themselves and about their contribution to the overall exhibition's Main idea, which should be addressed and maintained during presentation preparation. This analysis is important to visitors' understanding and active participation in a coherent path through the exhibition. 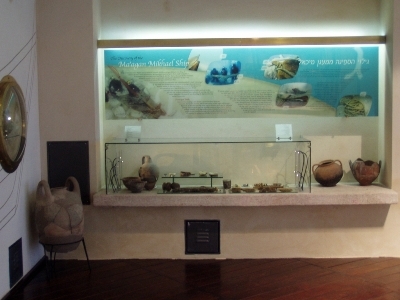 In the Ma'agan Michael ship exhibition, most of the exhibits are single objects, and there are some glass-fronted display cabinets in which specimens and small objects are grouped (for illustration, see Figure 3). In the Phoenicians exhibition there are sections of display according to subjects. In each section, presented as an island, there are several glass-fronted display cabinets with small objects in them. The islands are referred to as themes (for illustration, see Figure 4) and in each theme there are several objects (Kashtan, 1996). In order to define the scope of the presentations to be prepared, possible questions that a visitor might ask regarding the specific objects need to be listed. This process allows a comprehensive selection of possible answers to be planned to satisfy a wide range of visitors. The questions can be categorized into more abstract perspectives, which are actually general views that can be applied to the presentation of the objects in the exhibition. The process is inductive: beginning with the specific objects, listing the questions, and then extracting the relevant perspectives. The perspectives' definition helps define coherent sets of presentations that can be linked and related one to the other when delivered, as suggested by Serrell (1996). Following the Main Ideas of the exhibitions, in the ship exhibition the perspectives are more scientifically oriented: technologies, maritime archaeology, and conservation. In the Phoenicians exhibition the perspectives are more culture-oriented, emphasizing anthropological significance, the objects' uses, and ethnic influences. 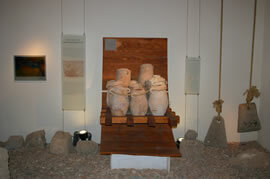 As an example we can consider the Amphorae exhibit. Considering the technological perspective, the visitors' questions may be: How was the object manufactured? Using what materials? (Table 2 presents the rationale for the presentation). When the list of presentations for the multimedia guide is ready, it is time to collect the relevant material. Since each presentation includes a question to answer, the writer of the texts has to review the literature in order to answer that question. In the Phoenicians exhibition case, the relevant information for each presentation was extracted from various sources such as Tresman (2004), Black (2003), Moscati (1988) and Raban and Stieglitz (1993). 2 Pottery vessels are quite heavy and breakable. But the main reason for using pottery is that there is no chemical reaction between the pottery and the products that are put in them. A close-up of the pottery of one of the amphorae in the model. Focuses sight and thought on the material - pottery. 4 The shape of the Amphora was designed for maritime trade. 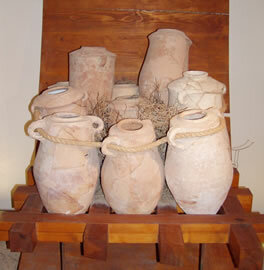 Its handles are planned to be carried by a porter, holding one amphora in each hand. Fade-in an amphora in the model. Highlight the handles. Helps a user visualize details described by the audio. 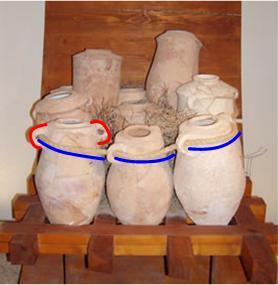 5 The form of the handles made it possible also to secure the amphorae with ropes after loading, and in that way, to avoid possible break of the amphorae. Highlight the ropes Aids visualization of the audio. 6 Finally, its conical base allows placing the amphora in a specially designed space in the ship. Highlight the base. Further aids visualizion of the audio. The literature on the subject of guidelines for spoken commentary for mobile guides, both audio and multimedia, is sparse. Ideas for the guidelines presented here are drawn from Serrell's guidelines for written interpretative labels for museum exhibitions, with the supplements and changes made necessary by the visual and audio aspects of a multimedia guide. The presentation text should be a closed paragraph. It has to contain elements specific to the object and the chosen perspective, together with informative and descriptive material. The structure of such a paragraph should satisfy the needs of argumentative texts. It encapsulates the main argumentation of the idea being developed. This idea should appear in the first sentence, as its subject; it imposes a logical order that is readily recognizable in subsequent sentences. Another important point to remember is to place the key words at the beginning of the phrase, thus facilitating the visitor's retention of the message in memory (Baños, 1995; Serrell, 1996). If there is no predetermined order for the presentation, one of the most basic guidelines is that each unit of information must be complete and independent (Baños, 1995; Lamarche, 1995). In the case of the PIL project, a presentation constitutes just such a unit of information of this kind. The spoken commentary section of Table 2 presents an example of spoken text generated for a presentation discussing Phoenician amphorae. The titles of the presentations, which in the case of a multimedia guide are the buttons that the visitors have to press in order to see the presentation, must be evocative, meaning that the link between the title and the content of the presentations must be obvious. They should also be impelling in order to raise interest and encourage the visitor to choose and view the presentation. Finally, their length should be of two to six words (like the titles of the written labels) (Baños, 1995). In the PIL project, the perspectives were kept as presentation titles to enable visitors to follow (or change) their perspectives of interest. Multimedia presentations should be referred to as interpretative texts, and therefore should tell stories in a narrative form. Their purpose is to contribute to the over-all visitor experience in a positive, enlightening, provocative, and meaningful way (like interpretative labels). They address the visitors' unspoken concerns: What's in it for me? Why should I care? How will knowing this fact improve my life? (Decrosse and Natali, 1995; Serrell, 1996). The content of the presentations must be condensed, yet understandable by the greatest possible number of visitors whose interest the museum wishes to capture. It must be clear so that it will be easily understood, rendering it potentially interesting and easier to retain in memory (Baños, 1995). In the case of the PIL project there is another kind of presentation: the 'general' presentation. Such presentations provide an overview of every perspective or theme in both the ship and Phoenicians exhibitions. The structure of these presentations should be different, since their purpose is to enumerate particular points in the main idea. They should be structured each as an open paragraph, satisfying the utilitarian criteria inherent in text intended for the general public, rather than the logical narrative organization criteria. The general presentations should appear in fragmented form, in which line breaks are used without any set pattern (Baños, 1995). One of the main constraints on multimedia text preparation, such as exhibition text writing, is that the message must be understood by as many people as possible. It is thus essential to use a simple, but not simplistic, writing style in order to reach the visitors regardless of their level of knowledge, and to involve only those concepts that the visitors need in order to understand the overall message (Baños, 1995; Decrosse and Natali, 1995). It is the writer's task to familiarize visitors with the appropriate terminology and the concepts to which it refers. Accordingly, all relatively specialized terms should be followed by a brief explanation so that visitors can fully understand them. Co-occurring expressions offer a degree of predictability in a text. The more predictable words there are in a sentence, the more easily information will be retained by visitors. In this way the educational goal of the exhibition will still be achieved: visitors will have access to condensed information. They will also have an opportunity to broaden their vocabularies by being exposed to new words with their meanings. (Baños, 1995). It is possible, for that matter, to use so-called BASIC (British American Scientific International Commercial) English. The aim of Basic English is to serve as an international second language for general communication, commerce and science (Ogden, 1934). Since visitors to museums come from varied backgrounds (in terms of both language and profession), it seems to make sense to use this simplified language for exhibition text. It is important to note that the application of Basic English must be done with care: the texts must preserve their scientific features. In the case of the Hecht Museum, Basic English is especially relevant, mainly because the presentations are to be played in English, even though Hebrew is the mother tongue of most of its visitors, and English merely their second language. Since the text in this case is intended to be heard and not read, writing must be more sound- than-sight-oriented (it must be clear and also euphonious). If the text for the multimedia guide is taken from the catalogue of the exhibition or from professional articles, it should be properly revised, translated if necessary, and annotated with indications of the pronunciation of foreign names or terms. Affirmative turns of phrase such as "that is why" and "thus", which favour predicative statements, should be used (Baños, 1995; Lamarche, 1995). These recommendations are followed in our work, as illustrated by Table 2. Text should be constructed in paragraphs of three or four sentences, each of containing not more than sixteen words. Condensing the text is necessary and means eliminating redundancy or unnecessary repetition, thus retaining a minimum number of words in order to enhance readability. In this way, visitors are brought directly into contact with the essence of the message (Baños, 1995). Visitors' short-term memory can retain between 8-16 words, and all (hearing) visitors have a longer short-term memory capacity (16%) for what they hear than for what they read, regardless of how fast they read (Baños, 1995). Since multimedia guide text is heard and not read, it is preferable to use short sentences and avoid departures from normal word order and nested subordinate clauses (Lamarche, 1995). Table 2 shows that these recommendations are followed. Information is most effectively retained if the structure of its presentation is cohesive and appropriate to the physical location of the visitor, as well as of the objects within the museum environment. This may be accomplished by using comparisons and references to space and time, which in turn may help the visitor to be oriented within the museum as well as across the various objects (Alfaro et al., 2004; Zancanaro et al., 2003). The PIL museum visitors' guide is context-aware; hence presentations are delivered to the visitor in the right place to begin with. The next step, after the texts for the presentations have been written, is to choose the 'right' picture for each sentence. Since each sentence has a part in the story which is told in the presentation (opening, supportive/ contradictive argument, closing), the image should complete and support this part. The possibilities of pictures that can be put in the guide are endless, among them: a picture of the exhibit in the museum (see Figure 6 as an example of an exhibit, taken out of Figure 5, in which the actual area of the exhibit is shown); a close-up of a detail in the object (see Figure 7); a parallel exhibit from a different period or culture (which is presented in the museum); an image of the object before it was retrieved from under the water; over-composing of measurements and information, as illustrated in the case of the Amphorae, where the figure supports the text (see Sections 4 and 5 of Table 2 and Figure 8); and so on. The purpose of the images in particular and of the visual element in general is to support the verbal element and to highlight significant points that are inaccessible to the visitor, without diverting attention from the actual exhibits (Zancanaro et al., 2003). Once the text has been written and the pictures chosen, the actual preparation of the presentation can begin. The sequence of pictures should be synchronized with the audio commentary and the transitions among them planned according to cinematographic techniques. The cinematographic techniques are also used for highlighting details in the images and for over imposing professional and technical terms. The language of cinematography (Metz, 1974), including shot segmentation, camera movements, and transition effects, is the basic resource for planning the animation and synchronizing the visual and the verbal elements of the presentation. The verbal element always drives the visual one. Therefore after choosing the right image for each sentence, decide which cinematographic technique should be used to make the connection between the images as comfortable and smooth as possible. The use of this type of animation allows the visitor to identify better the details introduced by the audio counterpart of the presentation (Nielsen, 1994). For a more engaging presentation, the visual element should not only focus on the right detail at the right time, but also support the presentation of new audio information by illustrating its relation to information that has already been given. In this way, continuity between the information is forged, in turn facilitating the viewing of the presentation while stimulating the users' absorption of new information. For example, two shots of the same image can be just one long shot of the same image, but when linked by a long cross fade, the user understands that background information is about to be provided (Zancanaro et al., 2003). In the ship exhibition, the cinematographic techniques broadly support two main tasks of the multimedia guide: helping the visitor to locate the described details of the object (e.g. via zoom-in effect), and combining information which is relevant to the exhibition but either not presented or hidden (fade effects). 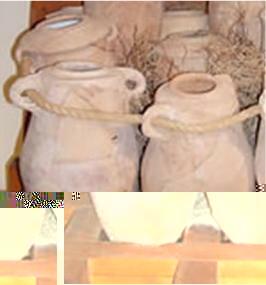 In the Phoenicians exhibition, the cinematographic techniques help visitors to orient themselves and easily find the right object within glass-fronted display cabinet in front of them (see Figure 4 as an illustration of this requirement). After the text comes audio preparation. Speech generation is an economically viable possibility yet it might not appeal to the visitor. In this case careful attention should be given to the selection of the reader or the voice synthesis tool. Human voice recorded by a professional actor is indeed recommended for a multimedia guide (Decrosse and Natali, 1995). Male or female voice? There is no certain answer to this question. It seems that men prefer a male voice and women prefer a female one (Lee, Nass and Brave, 2000). Lamarche (1995) noted that it is important to be aware of stereotypes: a man's voice is not necessarily more authoritarian, nor a woman's voice more seductive; it is the quality of the reading that really matters. Given the research nature of the PIL project, a voice synthesizer was used, even if it is noticeably inferior to human voice. The final step is generating the complete presentation by aligning the spoken text with the images, and applying the selected cinematographic techniques. Personalization is the way a system can alter its output according to the characteristics of the specific user. Personalization may include also contextualization and dynamic adaptation. For basic personalization, we take into account the fact that each visitor in the museum has different knowledge, goals, attitudes, etc., and so, in general, presentations should favour the dimensions that are more important for him/her. Contextualization takes into account the current situation in which the presentation is to take place. Dynamic adaptation of the presentation may take into account any element that has emerged so far during the visit and the sequence of presentations, and in particular can be based on a dynamic user model inferred from the user's behaviour and explicit input to the system. There are several ways to personalize a guide; however, there are two features strictly related to the content: coherence and cohesion. A discourse is coherent if it relates to each visitor as if the content were prepared for him/her. In fact, we have to respect two types of coherence: the first relates to the exhibition's Main Idea, and the other to the preferences of each specific visitor. In order to be used by a system which will accommodate personalization, the segments of information have to be retrievable and adapted, or they must be represented in an internal format which is then used by a program that dynamically produces the message. If we consider only the former case, the segments need to be combined by the system, and must be authored taking this aspect into account. The second feature, cohesion, relates to the way information is presented. Two related items can be presented in a 'context-free' way, such as: 'This is x …' and 'this is y'. A more cohesive way would exploit linguistic tools such as comparisons (e.g. 'as you have seen before in x …') or suggestions (e.g. 'as you will see in front of x …'). The use of such linguistic cues can help the visitor to consider the visit as a discourse which unfolds as s/he approaches each new item, which is presented according to the current context (item visited previously, preferences indicated during the visit, position, etc.). To make all this possible, authors should provide many alternatives. For example, they should generate many presentations with the same visual element, but slightly different audio elements, usually alternatives ways of presenting the same content (Rocchi, Zancanaro 2005). Thus the system is enabled to perform personalization that, together with multimedia, helps the visitor get engaged in the visit and feel supported or accompanied through the exhibition (Graziola et al. 2005). Preparation of information for museum visitors using multimedia is becoming a non-trivial task. It involves finding the Main Idea of the planned set of presentations and defining a set of possible areas of interest. After initial planning, appropriate material as a source for the presentations has to be searched. This material in turn has to be converted to appropriate spoken text (Audio) and integrated with images, utilizing cinematographic techniques to support the presentation's specific goal. Personalization can be addressed by generating alternative presentations (or presentation segments) that can be combined to form a coherent sequence of presentations supporting the individual visitor's interests and visiting path. This paper proposes a structured, general methodology for multimedia presentation preparation for cultural heritage sites. It applies ideas based on experience gained on several projects where multimedia presentations for museum visitors' guide system were prepared. Future work will include evaluation of the contribution of the multimedia presentation to the museum experience. This work is supported by the collaboration project of the University of Haifa, Israel and ITC/irst, Trento, Italy. The authors thank the Hecht Museum at the University of Haifa for allowing the use of its exhibitions for this research. Alfaro, I., M. Nardon, P. Pianesi, O. Stock and M. Zancanaro (2004). Using Cinematic Techniques on Mobile Devices for Cultural Tourism. Information Technology & Tourism 7(2), 223- 230. Alison, D. and T. Gwaltney (1991). How people use electronic interactives: Information Age - People, Information & Technology. In Bearman, D. (Eds.) Proceedings of the First International Conference on Hypermedia and Interactivity in Museums (ICHIM'91), an International Conference. Pittsburgh, PA: Archives & Museums Informatics Technical Report, 62-73. Baños, H. (1995). Writing Exhibition Texts. In: Blais, A., (Ed. ), Text in the Exhibition Medium, Québec: Société des musées québécois and Musée de la civilisation, 205-228. Bellotti, F., R. Berta, A. de Gloria and M. Margarone (2002). User Testing a Hypermedia Tour Guide. Pervasive computing 2, 33-41. Decrosse, A. and J.P. Natali (1995). The Oral Text as a Singular Form of the Written Text in an Exhibition. In Blais, A., (Ed. ), Text in the Exhibition Medium, Québec: Société des musées québécois and Musée de la civilisation, 157-179. Black, E., (Ed. ), (2003) The Ma'agan Mikhael Ship, The Recovery of a 2400-Year-Old Merchantman, Final Report, Vol. 1. Israel Exploration Society, Israel. Evans, J.A. and P. Sterry (1999). Portable Computers and Interactive Multimedia: A New Paradigm for Interpreting Museum Collections. In: Bearman, D. and Trant, J., (Eds. ), Cultural Heritage Informatics 1999: Selected Papers from ICHIM99, Pittsburgh: Archives & Museum Informatics, 113-126. Falk, J.A., and L.D. Dierking (2000). Learning from Museums Visitor Experiences and the Making of Meaning. Walnut Creek: Altamira Press. Goren-Bar, D., I. Graziola, T. Kuflik, F. Pianesi, C. Rocchi, O. Stock and M. Zancanaro (2005). I like it - An Affective Interface for a Multimodal Museum Guide. In Proceedings of Intelligent User Interfaces IUI'05, San Diego, CA. Available at: http://peach.itc.it/papers/gorenbar2005.pdf. Consulted 20.1.2006. Graziola, I., P. Pianesi, M. Zancanaro and D. Goren-Bar (2005). Dimensions of Adaptivity in Mobile Systems: Personality and People's Attitudes. In: Proceedings of the 10th international conference on Intelligent User Interfaces. New-York: ACM, 223-230. Kashtan, N. (1996). 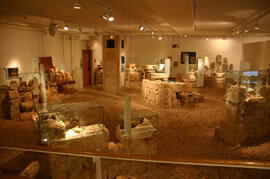 Maritime Treasures of Israel: from Excavations to Collections, Museum International 48(4), 8-14. Lamarche, H. (1995). The Audioguide as an Aid to Understanding an Exhibition. In: Blais, A., (Ed. ), Text in the Exhibition Medium, Québec: Société des musées québécois and Musée de la civilization, 181-188. Lee, E.J., C. Nass and S. Brave (2000). Can Computer- Generated Speech Have Gender? An Experimental Test of Gender Stereotype, Human factors in computing systems. In Proceedings of the CHI'00 Conference. New York: ACM, 289-290. McLean, K. (1996). Planning for People in Museum Exhibitions. Ann Arbor, Michigan: Malloy Lithographing. Metz, C. (1974). Film Language: a Semiotics of the Cinema. New York: Oxford University Press. Moscati, S. (Eds. ), (1988). The Phoenicians. New-York: Abbeville Press. Nielsen, J. (1994). Usability Engineering. San Francisco: Morgan Kufmann. Not, E., D. Petrelli, O. Stock, C. Strapparava and M. Zancanaro (1997). Person - Oriented Guided Visits in a Physical Museum, In: Bearman, D. and J. Trant (Eds. ), Museum Interactive Multimedia 1997: Cultural Heritage Systems, Design and Interfaces, Pittsburgh: Archives & Museum Informatics 69-79. Ogden, C.K. (1934). The System of Basic English. New York: Harcourt, Brace and Company. Raban, A. and R.R. Stieglitz (1993). Phoenicians on the Northern Coast of Israel in the Biblical Period. (Exhibition catalog) University of Haifa, Israel. Rocchi C. and M. Zancanaro (2004). Template-based Adaptive Video Documentaries. In Proceedings of Artificial Intelligence in Mobile Systems. Available at: http://tcc.itc.it/people/rocchi/papers/aims2004.pdf. Consulted 21.01.2006. Serrell, B. (1996). Exhibit Labels - An Interpretive Approach. Walnut Creek: Altamira Press. Tresman J., (Ed.) (2004). The Ma'agan Mikhael Ship, The Recovery of a 2400-Year-Old Merchantman, Final Report, Vol. 2. Israel Exploration Society, Israel. Vortruba, G.F. (2004). Reassembly of the Hull. In: Tresman J., (Ed. ), The Ma'agan Mikhael Ship, The Recovery of a 2400-Year-Old Merchantman, Final Report, Vol. 1. Israel Exploration Society, 211 - 220.